Is there bad art lurking in your home? Did you paint something at some point that does you no credit? Was that whimsical purchase at the car boot sale a misguided error? Sieze the day - dispose of your failed, hated, awful art works and help create something strange and beautiful, possibly terrible. Put them in the Art Bin. Michael Landy has installed a massive transparent skip in South London Gallery. Anyone can apply to chuck art in "Art Bin" - just take it down there. The work must be approved by Landy or his representative first but once you've got the nod and the work has been catalogued, climb the stairs to the lofty platform and chuck it in. This "monument to creative failure" is in its infancy. The paintings, sculptures, posters and drawings already deposited barely cover the floor but its fascinating to see what people have dumped: a mask made of bread, a broken down creation of painted drinking cups, busts with heads cracked open, daubs, creatures, sketches, photographs. During our visit, a young woman added a triptych by her emo inclined 17 year old self, joyfully tossing it with a satisfying clatter against the side of the bin, scaring the pants off a pensive observer who hadn't seen it coming. Art Bin is fun and will repay several visits over the residency as the "rubbish" mounts up, provoking some thought about how we value art and how subjective our judgements are and how influenced by emotional attachment. And in a coup of conceptual planning, the giant skip inside the gallery neatly complements what's going on outside, where the long awaited extension is being built. 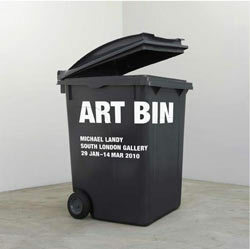 Art Bin is at South London Gallery until 14 March. Free admission.